Comprising 70% of upper body mass, the back muscles are often the most neglected. One of the main reasons for this is the lack of new ideas in the design of back exercise equipment. In the past 40 years little has changed; the same old lat bars and handles. With over twenty years of development, MAG handles and lat bars have truly revolutionized the resistance equipment accessory market. A common problem with achieving an optimal back workout has always been premature grip failure. You either ended your workout with the feeling that you hadn’t really worked your back or you resorted to using wrist straps or other devices that were cumbersome and, for the most part, ineffectual. This is where the idea for MAG was formed. Let’s begin with one of the most popular back exercises in resistance training, the pulldown. As most trainees start the pulldown they will instinctively grip the standard round bar in a partial state of wrist flexion (flexion is the position of the wrist as if you were flexing your biceps). In this position the line of force will be passing through the proximal phalanx, or the area of their fingers closest to the big knuckles. Only after a couple of reps their hand will rotate on the bar causing their wrist to move to a neutral position. At this position the line of force will be through the middle phalanx. As the trainee fatigues, the hand will rotate further causing the wrist to enter a state of extension. At this point the line of force will pass through the distal, or ends of the fingers. 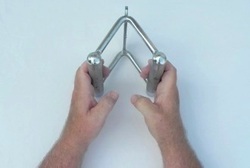 This is the least efficient position for the wrist to be in as the force is beginning to straighten the fingers until, at extreme fatigue, the ends of the fingers are the only part of the hand that is in control of the handle. This is extremely uncomfortable, prevents the trainee from achieving an optimal back workout and in some cases can cause injury. MAG, with its unique palm support, keeps the wrist in a partial state of flexion at all times. In this position, the line of force will pass through the proximal phalanx, the most efficient and less fatiguing grip position. As the back exercise progresses, the wrist maintains its original position enabling the trainee to achieve an optimal exercise. 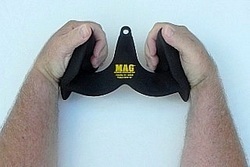 MAG is much more comfortable than a standard round handle as it disperses the force of the back exercise throughout the entire hand, not just the fingers. This takes the focus off gripping the lat bar allowing the user to focus on the targeted muscle group without prematurely ending their set because of grip failure. Lateral epicondylitis, or tennis elbow, is often associated with excessive gripping with the wrist in a state of extension. This ailment is common with many trainees, as they have a tendency to over-grip or squeeze the lat bar handles too hard with the wrist in extension. Because MAG keeps the wrist in a partial state of flexion and the focus is off of the grip on the lat bar, it has been shown to help alleviate this condition when doing pulling movements. Also, MAG has shown to be indispensable in Physical Therapy Centers for the rehabilitation of certain injuries. Unlike most other manufacturers, MAG is proudly made in the USA of USA made materials.